The 3138-N DAT Printer Applicator showcases the latest in dual panel labeling. Featuring Label-Aire's renowned New Generation Technology, the 3138-N DAT is the ideal choice for the most demanding print and apply applications. The heavy duty dual action air cylinder tamp rotates 90° across the conveyor to apply the first printed label. The second straight line stroke extends applying the second label onto the side panel. Advanced features in our standard 3138-N Printer Applicator include automatic setup with multiple programmable label pages for easy change-overs to labels different sizes, rate compensation for improved label accuracy, and advanced user-configurable I/O connectivity. 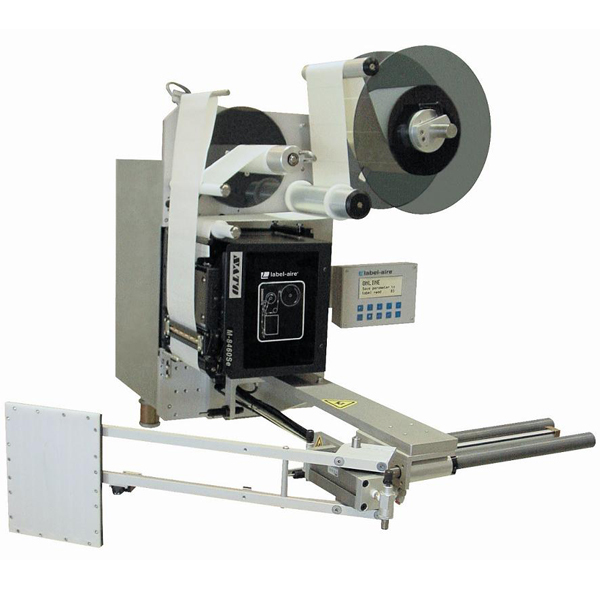 These helpful features greatly simplify setup and change-overs making labeling easier. The workhorse 3138-N Dual Action Tamp is just as rugged as it is advanced and user-friendly. Its tough stainless steel and anodized aluminum construction is corrosion resistant for long-term durability and maintenance-free operation in the most hostile environments.